Researchers at University of Missouri-Kansas City report that not only does a smiling face make a person look younger, but it also makes a person seem “courteous, likable, and competent,” according to a story in Psychology Today. 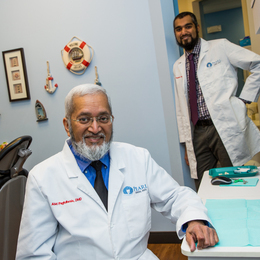 The dentists of Pearl Dental Arts—Abid F. Paghdiwala, D.M.D., and his son Murtaza Paghdiwala, D.M.D.—believe a smile can accomplish all this and more. Pearl Dental Arts, which has locations in Newtown and Levittown, has been serving patients in Bucks County and beyond since 1981. The practice offers an array of services, ranging from general dentistry to implant placement utilizing the latest computer-guidance equipment to cosmetic enhancement such as Invisalign, teeth whitening and veneer placement. The technology at the fingertips of the dentists at Pearl Dental Arts has made great strides over the years. Invisalign, a treatment program wherein patients wear a series of fitted trays for periods of time in order to gently shift teeth into positions offering better comfort and aesthetics, is one example. The benefits of this technology, among others, include dramatically reduced treatment time. Another piece of ultramodern technology at the disposal of Pearl Dental Arts practitioners relates to veneers. In the past, patients often had to allot time for multiple office visits to achieve their best smile, but Cerinate one-hour porcelain veneers now offer brighter smiles in just 60 minutes. Composite fillings have made dramatic improvements as well. Compared with the dark, metal fillings of last century, Pearl Dental Arts now offers fillings that mimic a patient’s natural tooth color. Of course, the artistry of a skilled professional is needed to ensure a patient’s best overall look. In line with this goal of providing each patient with his or her brightest, whitest smile, Pearl Dental Arts also offers cosmetic whitening options, both in office and at home. Patients can use these during the day or at night. To ensure patient comfort, often the doctors will have patients utilize desensitizing toothpaste or another agent for approximately two weeks before treatment. Drs. Abid and Murtaza agree that improving patient aesthetics and comfort in ways such as this, as well as through treatment, makes their careers wonderfully fulfilling. Dr. Abid adds: “We are not just working on the teeth. To us, we are working on the whole person. Their oral health has an important bearing on their overall health, both physically as well as psychologically. Very often we have patients who go through so much education, spend years and years on graduating from college and then when they come to us they will be at the outset of their career but don’t have a smile that is presentable when they start looking for a job. Published (and copyrighted) in Suburban Life Magazine, June 2018.